Following a two-year hiatus, the U.S. Nuclear Regulatory Commission (NRC) has resumed issuing license renewals for nuclear power plants. On October 20, the NRC renewed the operating licenses for Limerick Generating Station Units 1 and 2, located northwest of Philadelphia, extending their license expiration dates by 20 years, to 2044 and 2049, respectively. With this action, the NRC has granted license renewals providing a 20-year extension to a total of 74 of the 100 operating reactors in the United States. Nuclear power accounted for 20% of total power sector electricity generation in 2013. NRC has the authority to issue initial operating licenses for commercial nuclear power plants for a period of 40 years. The decision to apply for an operating license renewal is made by nuclear power plant owners, and it is typically based on economics and the ability to meet NRC regulations. Operating licenses are renewed by NRC for a period of 20 years. To date, no applications for a second, or subsequent, license renewal, which could extend nuclear plant operating lives to 80 years, have been filed. Renewing an operating license is contingent on several factors, including the safe management and disposal of waste. The NRC must determine that it has reasonable confidence that spent nuclear fuel can and will, in due course, be disposed of safely. This is known as waste confidence. Waste confidence enables the NRC to license new reactors or renew their operating licenses without examining the effects of extended waste storage for each individual site pending ultimate disposal. In June 2012, following the termination of the repository program at Yucca Mountain, the U.S. Court of Appeals for the District of Columbia Circuit struck down certain provisions of NRC's Waste Confidence Rule and stated that NRC should have analyzed the environmental consequences of never building a permanent waste repository. 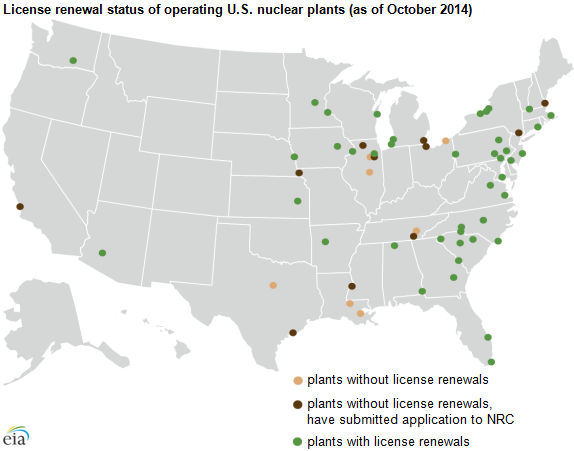 In response, the NRC issued an order in August 2012 that suspended actions related to issuing license renewals as well as new operating licenses, although the nuclear power industry continued to submit applications for license renewals. On September 18, 2014, the NRC issued the revised and renamed Continued Storage of Spent Nuclear Fuel rule, which became effective on October 20. With the issuance of the revised rule, the NRC may now resume issuing license renewals as well as new operating licenses. NRC is currently reviewing license renewal applications for 17 reactors, including one for Indian Point Unit 2. Although the September 2013 expiration date of the original 40-year operating license for that plant is already past, NRC rules allow for continued operation of a reactor until the NRC completes its review of a pending license renewal if the application was submitted at least five years before the current license expires. Indian Point Unit 2, located on the Hudson River north of New York City, currently continues to operate according to this process, known as timely renewal. To date, Indian Point Unit 2 is the only reactor that has entered the process of timely renewal. 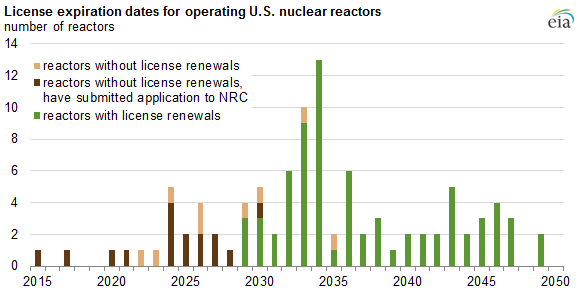 NRC also expects to receive license renewal applications from seven more reactors between 2015 and 2018. Plans for only one plant have not yet been announced; however, license expiration for this plant is not a near-term issue.